Tired of serving your premium, chilled sake out of stoneware or a bottle? 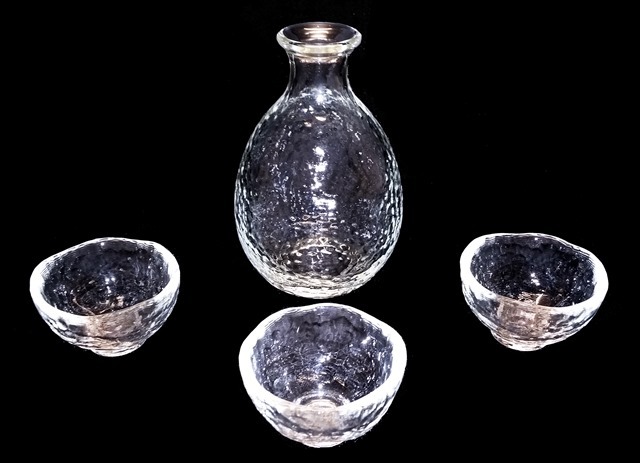 Try this lovely glass sake set and add a touch of sophistication and grace to your sake experience. Made in Japan, this sake set consists of one glass tokkuri and three glass ochoko and comes packaged in a presentation box, just in case you fancy giving it as a gift. If you’re looking for sake to serve in your new set, check out our Ginjo and Daiginjo sakes, these are sakes that are usually served cold. You can find the sakes we recommend having cold by navigating to our sake shop and clicking on the ‘cold’ pictogram.